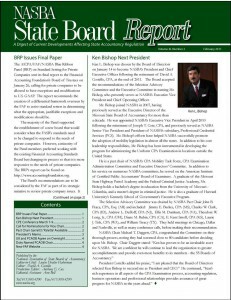 The Alabama State Board of Public Accountancy’s peer review requirement is being challenged by a CPA firm as being “arbitrary and capricious in nature, and not tied to any ascertainable standard or methodology.” On November 8, NASBA submitted its amicus curiae brief in support of the Board’s position in the case of Scott A. Whisenant, CPA d/b/a Whisenant & Associates v. Alabama State Board of Public Accountancy, in the Circuit Court of Montgomery County, AL. In the amicus, NASBA legal counsel Noel L. Allen points out that: (1) the vast majority of states also require peer review per the Uniform Accountancy Act; (2) other states’ courts and attorneys general have upheld similar peer review programs; (3) peer review is a means of public protection; and (4) if Alabama cannot enforce its peer review requirement, Alabama CPAs and CPA firms might not qualify for mobility, which would then require such licensees to register in each other state in which they offer or render attest services. The amicus references cases from South Dakota, Nebraska and Missouri in support of its arguments. The amicus curiae brief can be found on NASBA’s Web site www.nasba.org.